Jenifer Metzger : What Does It Mean To Cast Our Cares? 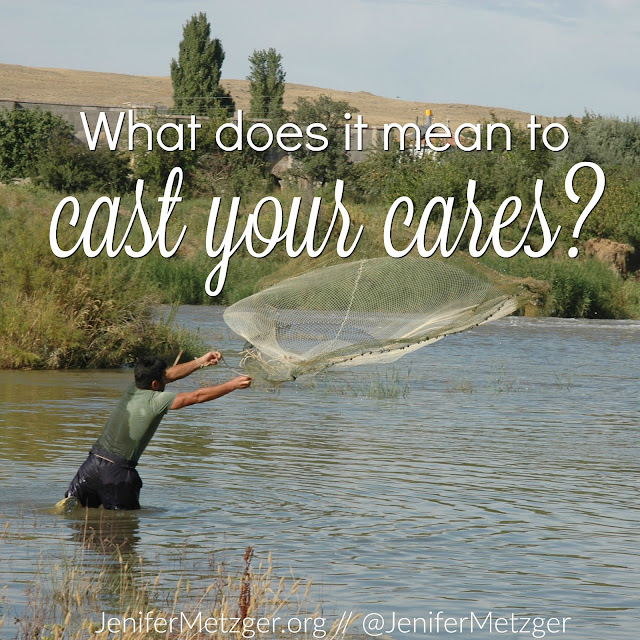 What Does It Mean To Cast Our Cares? The Bible says to cast our cares on God. God could have chose any word for these verses. Yet, out of the hundred-thousand, or so, words in existence, God choose the word cast. When I hear the word cast, I automatically think of someone fishing. They cast their line out which means they throw, hurl, or fling their line as far out as they can into the water. They try to get the line far from them. God says to cast our cares on Him. What does that really mean? It means to throw our cares to Him. Hurl our cares to Him. Or fling our cares to Him. It doesn't mean to simply hand Him our cares and it surely doesn't mean to get them close to Him, then pull them back! Whatever trial you are facing, whatever pain is upon you, cast it to Him. God is far better equipped to deal with it than you are. Cast it to Him and let Him sustain you. What a great encouragement! I need to remember to do this with my cares. How truly blessed we are.